Whilst researching our former President, Professor Thomas Gibson (1915-1993), for a display marking 100 years since his birth, I came across an entry in our museum catalogue for a 20-mm Cannon Shell. Tom Gibson was a renowned plastic surgeon and this seemed like quite an unusual item to be linked to him. After a little more digging around, I found that the cannon shell had actually been removed in surgery by Gibson during WW2 – Gibson had been Captain of a Royal Army Medical Corp maxillofacial surgery team. What made this find even more interesting was that the cannon shell linked to an article Gibson had written for The Lancet in 1946, a copy of which we hold in the College Library. 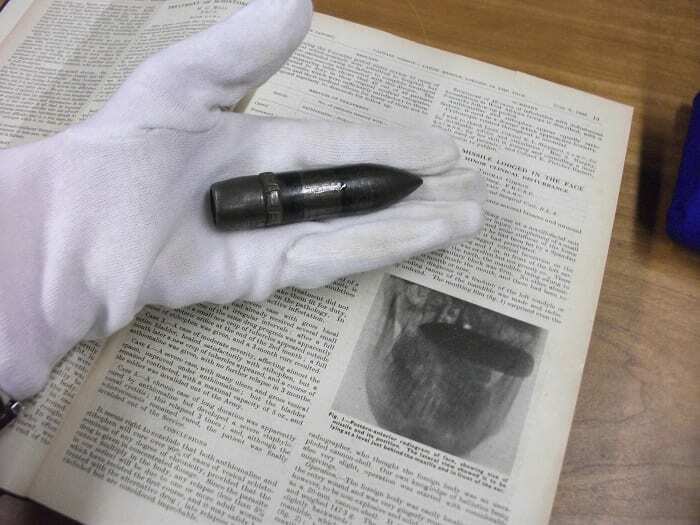 This article featured a photograph of an x-ray showing the shell lodged in the face of a Gunner. Remarkably, the soldier was unaware that it was even there! He thought a bullet had just grazed his face. The 20-mm cannon shell measures 85mm in length and weighs 147.3g! 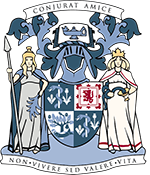 The College archive houses a collection of Gibson’s case histories, publications, photographs and correspondence (RCPSG 55).